Day 15. May 21st. Auxonne - Meursault. 45 miles. 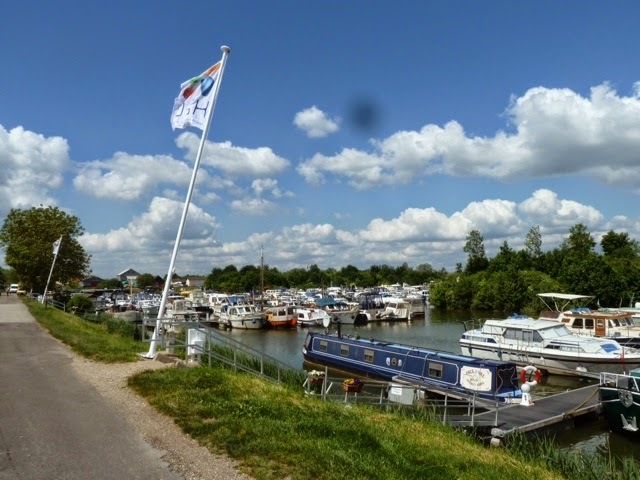 A leisurely drive, we took some time to explore St Jean de Losnes - a place where several rivers converge - it had a large marina and was a starting point of river cruises. There are boats for sale.....oooh! Onwards and it took no time to reach Meursault our next site. Le Grappe D'Or (The golden bunch) appears very laid back - a sign asked us to park up in a pitch and report back at 5pm to pay. It was just 1.30 pm so we settled on to the biggest pitch (well why not?) overlooking Meursault and the vineyards and took lunch outside. 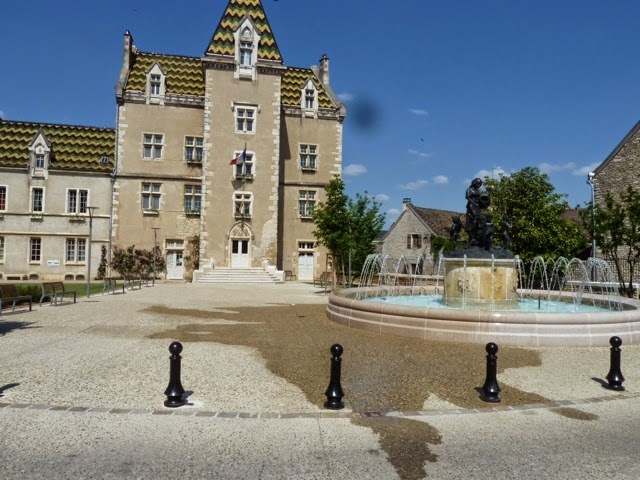 We walked the 1/2 mile to the centre of Meursault - what an beautiful ville - clean, lots of artisan patisseries, traiteurs, gift shops, (expensive) restaurants and wine sellers, manicured and gorgeous. The viticulteurs' houses were also impressive. Apparently the Hotel de Ville was used in a French film called La Grande Vadrouille - for the "cult scenes"?! ( Gerard Oury director) - some info for you film buffs! 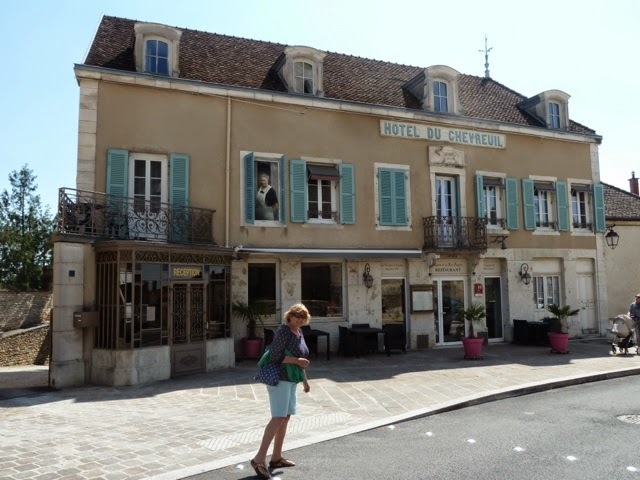 A lovely Hotel with a Trompe l'oiel Madame - and Carol. Spent time doing nothing sitting by Rex in the sunshine and dinner chez Rex. Day 16. Meursault. 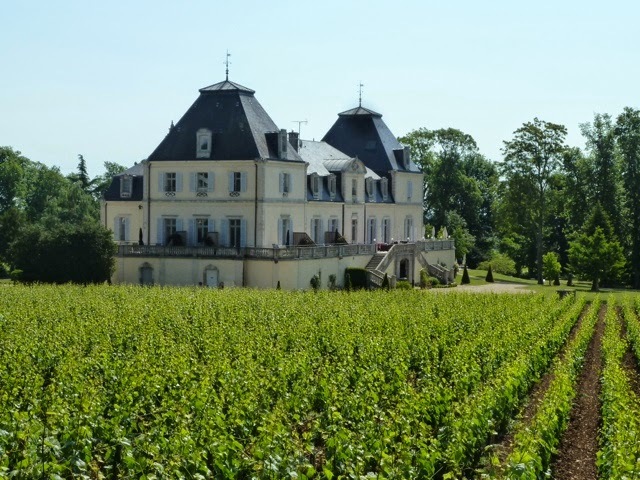 Cycle ride to Puligney Montrachet. 15 kms. 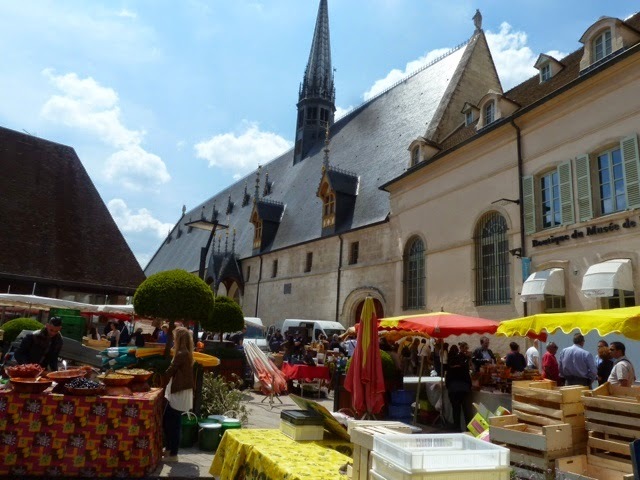 Today there was a local market in Meursault so we walked there in the morning. We bought vegetables and cheeses from the stalls which would have been cheaper from the local supermarket but we wanted to support the local economy. Fromage, a pain au cereal and a crumble mrytille (blueberry) tart from the artisan boulongerie, and a bottle of rosé. Then back to the site for an al fresco lunch made with our purchases - delicious! After some time relaxing in the sun we decided we needed some activity so got on our bikes and cycled to Puligny Montrachet. 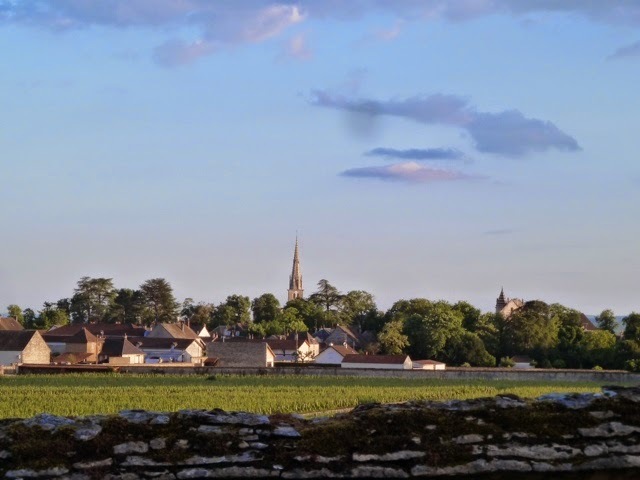 Those of you who know your Burgundy wines will recognise some seriously expensive wine names as we cycle around the area. It was delightful meandering leisurely through the highly maintained vineyards. There are similar vineyard cycle routes as in Alsace with cyclers and walkers allowed on the small roads used by the wine growers and prohibited to other vehicles, but it is flatter here. Back to the site via Meursault again - it is beginning to be our favourite place in Burgundy! Dinner in the on site restaurant which was pleasant. We sat by a lovely family - the mum was Italian and dad German - the young son ? 2 years could speak both languages and the parents good english also - impressive! Actually they were an exception as the majority of persons on this site are Dutch. The site is Dutch owned so don't know if that's anything to do with it but big vans come and go at the start and end of each day. 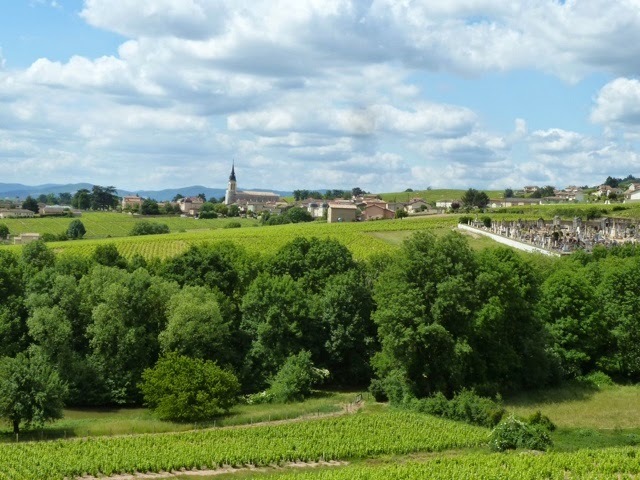 Off to Beaune for the market - cycled via Volnay and Pommard which are both lovely places renowned for their light red wines. The market in Beaune was impressive. We decided to buy ingredients for a picnic lunch in the market hall. We chose several salad items including a salad called Museau de porc - actually this is pig's nose! Unfortunately the stall did not provide forks so lead to a frantic search for a shop which sold forks. Found some in the Casino supermarket - phew! Wandered around Beaune which is a lovely place - the capital of Burgundy. Passed by the Hotel Dieu (the hospice of Beaune) - an alms house originally for beggars - not a bad gaffe! We retraced our steps back to the centre and called in at la Maison du vin - this shop had a small art gallery attached showing modern art for all to freely peruse - Warhol, Piccaso,Dali, Miro, Litchenstein amongst the ones we recognised! Then on to the wines from €75 upwards - we admired the bottles especially the one labled €2000! Eschachaut or something, and cooly left. We remember visiting here in the 90's where for a nominal fee you were given free reign to taste all the wines including Grand Crus - we had a great time even though the kids were bored rigid. Today you pay a sliding scale for a limited tasting, €10 for 6, €15 for 10 and so on, and obviously the better the wines the more the charge so we gave it a miss. Walked a little way around the remparts and then back through the town to pick up our bikes, and retraced our lovely route back to Meursault. 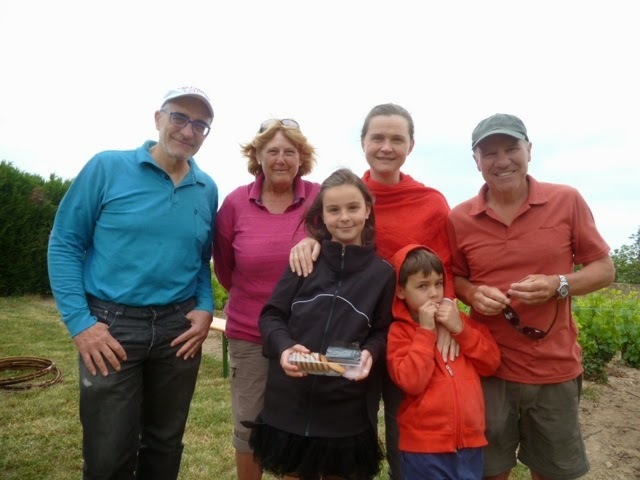 Now it would be rude not to sample the produce of the area, so after peering in to several wine tasting / producers places and although still on our bikes and a little sweaty we plucked up the courage and entered the grandest: Bernard Delagrange. We were greeted by a formidable looking Madame "Vous désirez quelque chose?". 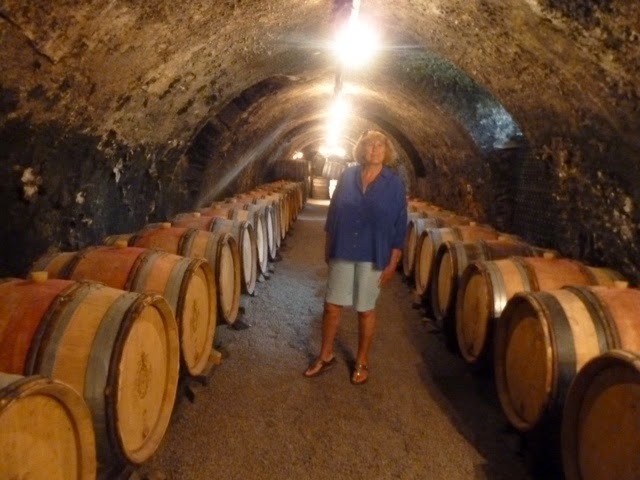 She lead us to a private tasting area by-passing a party of rather loud Americans requesting the most expensive wine of the house. Now, we don't think it right to taste grand crus and then not buy anything, so we asked to taste the cheapest, no, the least expensive and sorry-to-trouble-you-Madame, wines available which suited our budget - which we did and very nice too, but the nice Madame insisted we try the €22 Meursault so we did just to be polite. We were a little underwhelmed so bought a couple of the cheaper ones which we could fit in our saddlebags and whilst it was packaged she asked us to view the XV century caves. We were so impressed by how graciously we were treated given we bought a pityfull amount. Graham said so in French to Madame who replied "C'est normale!" 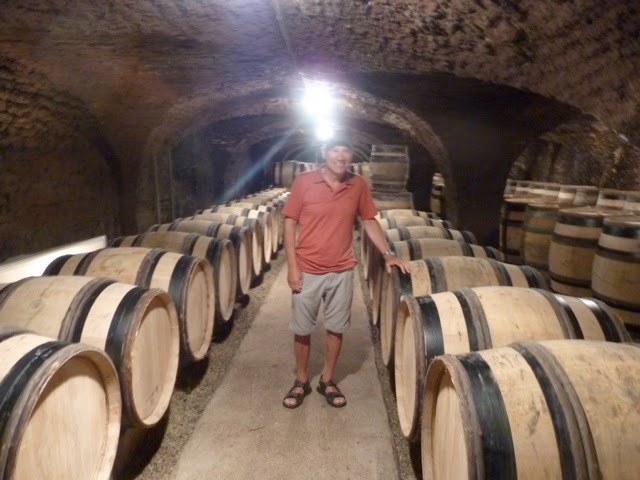 The tasting bug was with us now and we sought out another producer - Ropiteau. Felix gave us a tasting of our favourite cheaper Chardonnay and then we tried the white Meursault. Wow! This was it, the nectar we imagined, and we were only half-way up the price range at €29,70. Fabulous and full. Absolutely gorgeous and not to be confused with cut price supermaket Meursault available in the UK. Then the red - not to Graham's taste which was due to his poor palate according to Felix. Apparently we are hooked on the more sugary Bordeaux and ahem, vulgar wines from Australia and so unable to appreciate fully his Pinot Noir. However we were still invited to visit the Caves as he packaged our sole bottle of cheap €9 Chardonnay. (And those of you who are lucky enough to celebrate my next birthday might be sharing it between you). Meursault is now officially Graham's favourite place in France. Back to the site for a pasta supper and the pleasure of watching Eurovision on French TV! The French entrant was even worse than ours and they are talking of pulling out. Can you imagine FH calling for a referendum? Score for La Grappe D'or 8.5/10. A fantastic location, friendly staff, restaurant on site. Pool not yet open. Shower facilities a little basic - but clean. Day 18. May 24th. Meursault - Fleurie 42 miles. 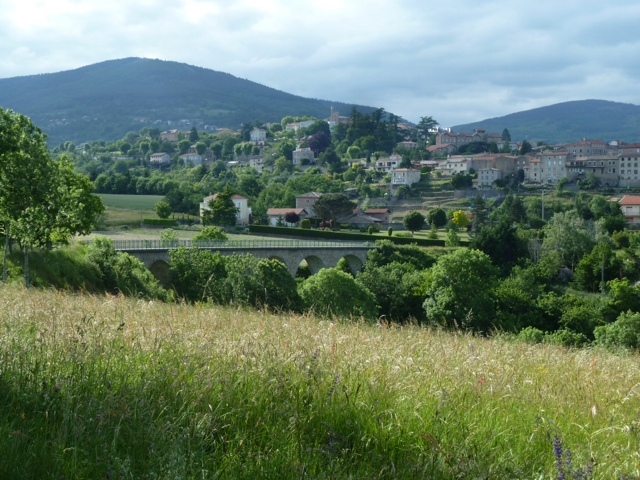 Another nothing day - travelled to Fleurie driving through Macon which looked a lovely town. A quick dash through a supermarket for supplies before closing time - it's Dimanche and in France all shops still shut most of the day! Given it is also a bank holiday Monday we are lucky to find anywhere open. On to the site in Fleurie. Took ages choosing a pitch - decided to be next to the shower block. Poor choice! We have holiday lodges behind us whose occupants were out when we arrived and so we are stuck with excited children screeching in the showers and their equally excitable parents drinking, shouting and singing the Marseillaise! It's a bank holiday weekend! Oh well - come tomorrow afternoon we hope peace will return. Spent the rest of the day dossing by the van in mostly sunshine, dinner a one pot rice wonder cooked by Graham which was very nice. Then watched a French dubbed daft film called Cowboys contre Envahisseurs (Aliens) - at least the tv works. And no adverts throughout the film , as usually french tv has a quota of 5mins adverts to 1 minute feature! Day 19. May 25th. Fleurie. Cycled 27kms. Another vineyard cycle day for us complete with the usual picnic. Cycled to Fleurie and then via Lancie and Villié Morgan to Chiroubles, a nice 27kms circular route. 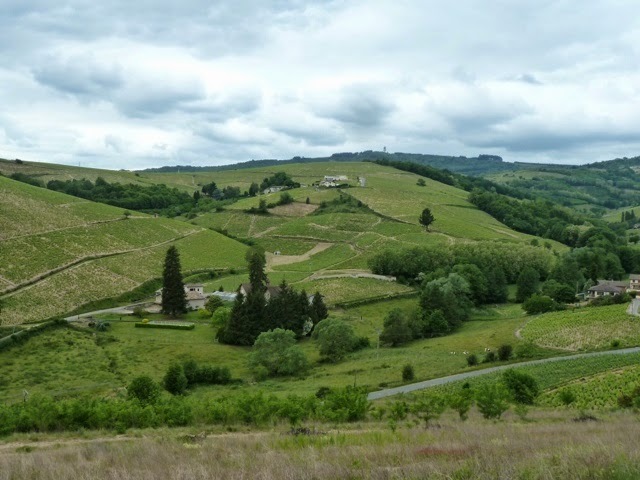 A view of Fleurie en route. It was much more hilly than we thought it would be, Carol was seriously worried her battery would give out! Nearly half way up to Chiroubles here. In Chiroubles we saw a poster advertising a picnic with a local vignoble Christophe Savoye - so we cycled into his cave entrance to be greeted by the man himself. Rows of picnic tables were laid out and also games for children. Christophe invited us into his tasting room and gave us a tasting of his wines from the youngest through to the more expensive. Cheese, saucisson, bread were laid out to nibble. Very impressive. If you've ever wondered, as I have, how many grapes make a bottle, then the answer chez Christophe is 3 for the most concentrated: 3 ceps (vines) to one bottle. No wonder it's so nice! We bought a bottle of Cuvee Prestige 2012 and was invited to sit in the picnic area to enjoy our picnic complete with another glass of wine . Another glass of wine suited to be served with cheese appeared towards the end of our lunch - such generosity! 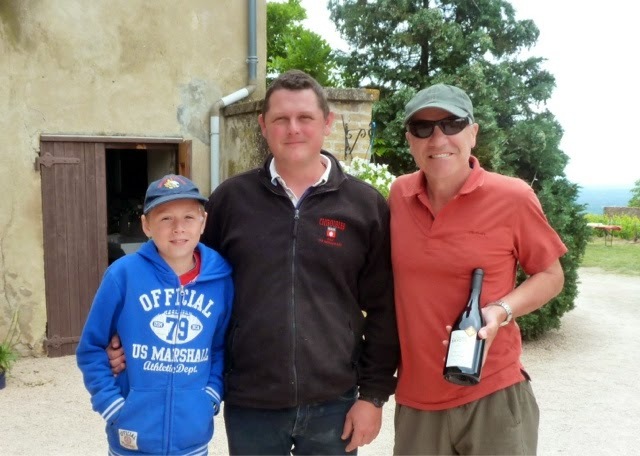 Christophe and future viticulteur fils photo-bombed by strange man with a bottle of wine. Sat at an ajoining table was Maria and André from Lyon with their 3 children. We spend an enjoyable time speaking with them both practicing the other's language. Maria is from Slovakia and spoke excellent english. André is in real estate (handy!) 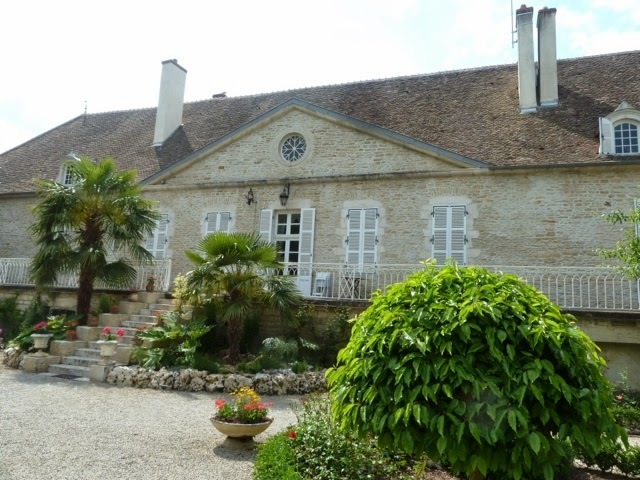 so gave us an insiders guide to house buying in France. The children were delightful playing happily whilst we chatted. We swapped contact details as we left and took a group picture with a windswept Carol. Back to Fleurie via the Vin de Fleurie shop and further tastings of the wines of the week - one of which had been produced by the husband of the lovely lady serving us. Decided to buy a bottle - not his unfortunately - sorry Madame! Carol will have to put up with no white wine this evening as Fleurie is a white free zone! 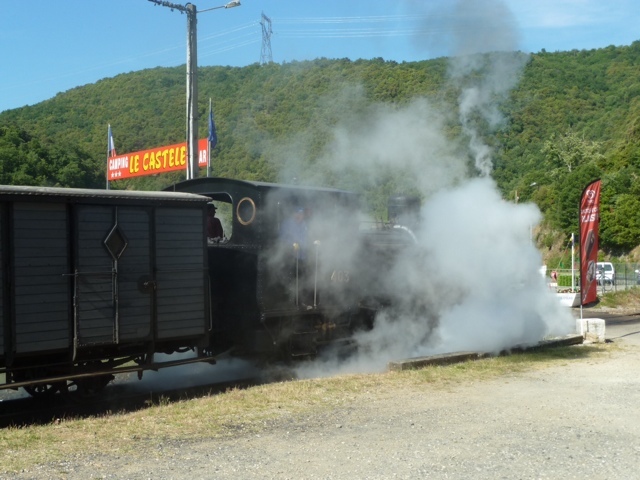 It was quite cool weather wise as we returned back to camp and tomorrow is predicted to be worse - so will move on to nearer Macon in search of the white wines we like. Score for La Grappe de Fleurie. 8.5/10. Unfortunately too cold for the lovely looking pool. Clean facilities but still preferred showering chez Rex. Nicely located a short distance from the centre of Fleurie. So a fond farewell to Fleurie and onwards down south in search of warm weather -we made a decision to turn away from Macon for now. Got lost negociating through Villefranche-Sur-Saone and then on through vast Lyon to Vienne and a stopover at Condrieau for lunch. The temperature appeared to be going up from 15 degrees to 18. We began our ascent to our site at Pelussin and the temperature began dropping and the wind picked up! When will we learn that hills mean cold! The site did not meet it's write up - yes there is a swimming pool but on the edge of the site which at present is cold and windy. The pitches are sloping dramatically on a hill. Never mind we'll make the best of it and aim to make an early getaway tomorrow. We took a walk through woods to an old rail viaduct before dinner. Brrr it's chilly! We will aim for a low river side position tomorrow in search of shelter and warmth, and hope the resulting hair style is less bouffant! 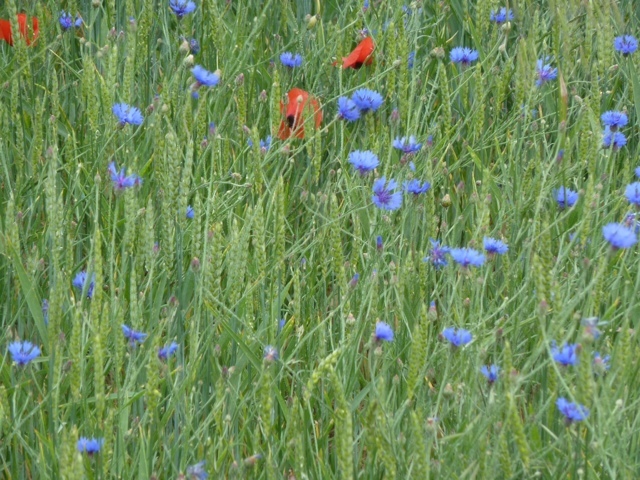 Nearby fields of corn with wild cornflowers and poppies - so beautiful and french! Score for Bel'Epoque du Pilat. 7/10. Would probably be lovely in good weather. Hilly unequal pitches in dense wooded areas. Middle of nowhere. Woke to a sunny but chilly morning. After much debate we set off back to the Rhone Valley driving just a little more south. Graham would have preferred to have headed back to Macon but graciously conceded (again!) to Carol's southern wish. 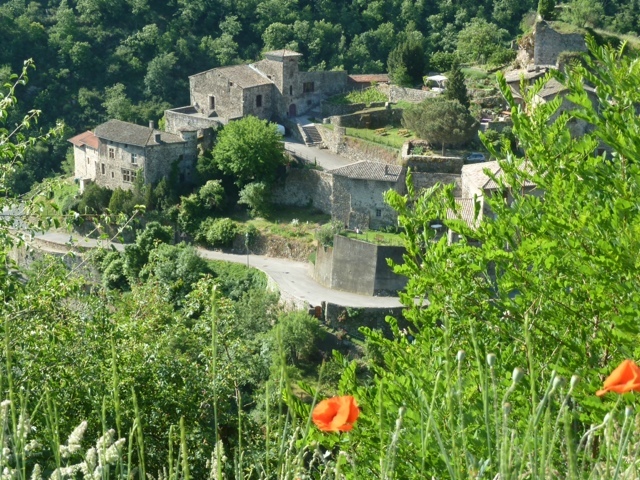 A short drive along the curving roads circumnavigating the hills led to a medieval village called Malleval an unexpected delight. No time to stop - no room to stop! Then back on the main road to St Jean de Muzols. Settled on to the pitch and then a spot of sunbathing by the pool. 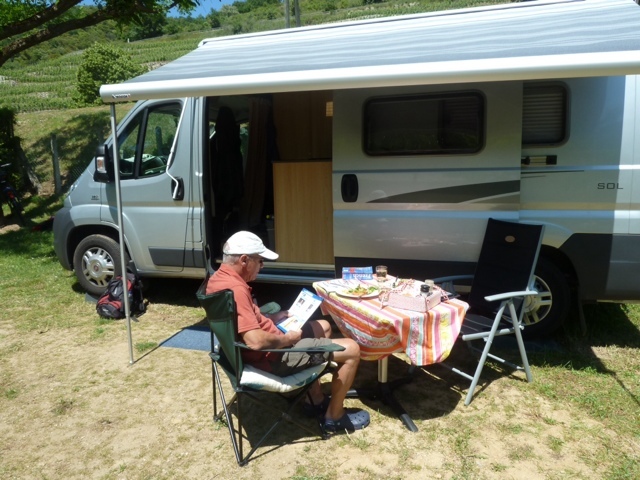 Lunch al fresco - note the tablecloth, reclining chair and awning - oh yes we are now able to almost fully hold our heads up compared to our peers camping French style! We let ourselves down by the lack of floral arrangement on the table or groundcover but we are getting there (have got fancy bread basket please note - purchased in Beaune market). We hope to stay a couple more days to enable Graham to build up his resilience prior to the drive back north on the - gasp- péage motorways! Yes Graham has been finally worn down by the detours and stop and go driving on the B roads. Actually it was Villefranche which did us in - stopping at every bus stop every 400m across town to pick up one person can get to you after a while in a RHD vehicle. Tomorrow we may have a cycle ride out and perhaps try some wine - well we are in Côte de Rhone territory now and it would be rude not to!! 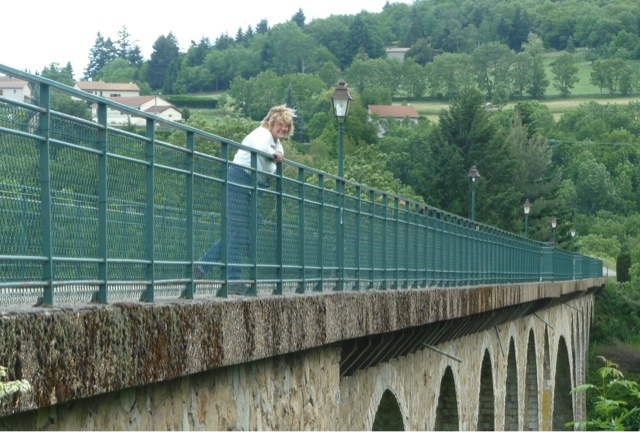 Hi, just caught up with your last few weeks, sounds like it's turned into a wine tasting tour of the Burgundy region, but why not? Just be careful you don't fall off your bikes! The villages look very picturesque, if shut on Saturdays. Food sounds scrumptious although I'm a vedgy (definitely no pigs nose for me!) Hope you continue to enjoy.